The Lord Palmerston pub in Palmerston Road, Southsea. Plans submitted by pub chain JD Wetherspoons PLC for a 24-bed hotel in the disused floors above The Lord Palmerston in Palmerston Road were approved yesterday. Members of the council’s planning committee voted unanimously in favour of the project that also includes a first-floor terrace to be used by pub customers and a lift for hotel guests. However, they imposed conditions to try to limit the level of noise and disturbance for the venue’s neighbours. Residents attended the meeting to raise their concerns. Stephen Ferguson, of Auckland Road West, was there to object on behalf of himself and neighbour Michael Bilton. ‘The claim there is only a small impact on residents’ amenity is wrong. ‘Our deeply held concerns are about noise and the roof terrace. ‘Seventy customers would be allowed to drink and smoke in an open air terrace. It’s like an amphitheatre up there. There’s significant noise amplification. Do you think all those drinkers won’t make a noise? 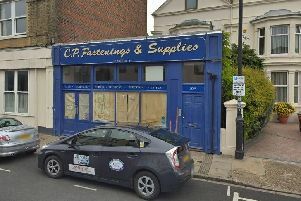 But Brian Sellers, an architect from K D Paine and Associates which works with Wetherspoons, defended the plans. 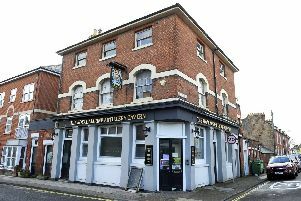 Speaking to the committee he said: ‘This would be an effective use of vacant space and would help secure the viability of it as a public house. But councillors were concerned that approving the application could lead to use of the roof terrace for the pub, without completion of the hotel after it was confirmed the site already had permission for it. Deputy council leader, Councillor Steve Pitt, said: ‘This is a difficult one. ‘The only thing is to make sure that acoustic screening goes in place. What could happen is the roof is cleared and off they go using it with different times and no acoustic monitoring whatsoever. Councillors agreed to two conditions attached to the hotel’s approval – that the roof terrace cannot be used until the hotel is completed and open and that the terrace can only be used between 9am and 9pm. A study on local parking confirmed that hotel guests would be able to use nearby Ashby Place car park. Wetherspoons confirmed the hotel would create up to 15 jobs.